Well, this challenge definitely took the most time and money to do. I've been painting and shooting since Saturday. 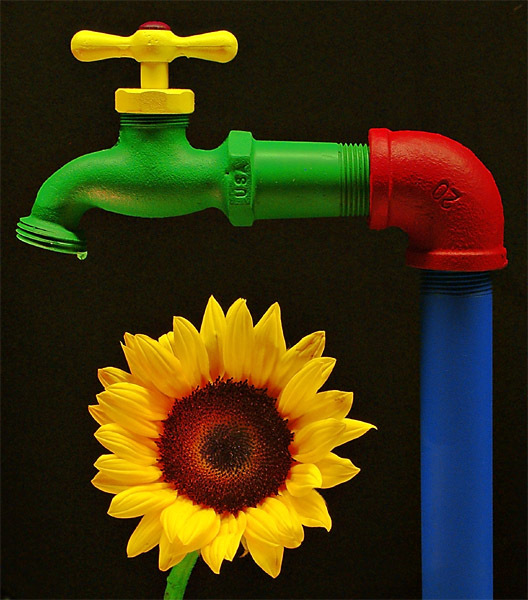 The flower stem looks unnaturally green because I spray-painted it (actual paint, not PS) the same color as the faucet. Hopefully it doesn't turn people off. Two handheld flashlights were used to illuminate the water drop and flower face. Unfortunately, you can see the glare on the bottom of the faucet. this is boring. where did you take this? where is this black wall? i hate these backgrounds...shadowy walls...they're so... fakey. Amazing photo ! I'm so happy you posted your details. Congrats on a well deserved win ! Awesome picture, you are very creative. I disagree with your comments Your ribbon is well earned- The best in my eyes. Congrats to you and a very good idea. this picture is amazing! all your work 'paid' off!! congrats!! Fun, quirky shot, Tom. Certainly deserving of a ribbon! Congratulations! I think you did a great job. Congrats! Wonderfully colorful shot. I never got a chance to vote on it...but it would have been high on my list for sure! Great shot and another red for ya!!! Very colorful, interesting composition. Nicely done. Technical quality and composition are very good. The use of color in this image against the black background is outstanding. One of the best images in this challenge. Well, I don't like the drip coming from the faucet. And you definitely shouldn't win this competition because there are pictures that exemplify still life better than this one, and are more beautiful than this one. That being said, this is by far the best use of color I've ever seen in a photograph in my life. You've gotta enter this into another contest, one dealing with color, or fun images, or flowers, or something. I'd work on a background for this picture, if possible. Fun Shot -- loads of color. Can't help but smile when I see a sun flower. I expect it to reach up and turn the water on. But, when the water comes out - it comes out in colors! Nice! What great colors! I'm curious if this was painted specially for the challenge or you normally have a painted water tap. Either way, I think it really stands out, especially against the black background. Lighting is good, although there is a slight yellow reflection on the green. I also like the addition of the water droplet. The sunflower continues the theme of bright summer colors. The petals seem a touch on the soft side, but in a way that compliments the flower more and makes it stand out more against the tap. Very colorful and great image! Great use of colors! A strong 10! Perfect! Did you paint the water spout for this shot? Would problibly have gotten a ribbon in the primary colors challenge, nice shot. Great color and composition. This image really pops out at you. Of of my favorites. Lego & a drop! Well done! Beautiful composition, colors, lighting, subject. All --- excellent. Could not criticize anything about it. And all very creative on top of it. What does this look like with a white background? The black background makes the mood seem a little strange to me, even though the colors and chapes are robust. Really neat colors....primaries! Beautifully shot, and lit. Nice going. very very cool... I like the primary colors. Great color. Could be a poster. Great use of colour and well lit. Absolutely love it. Proudly hosted by Sargasso Networks. Current Server Time: 04/22/2019 12:29:14 AM EDT.